Listening to the audiobook version of this book was a really interesting experience. This was at the invitation of the author, Genevieve Graham (thank you!!). And the narrator, Alexis Quednau, has such a pleasant voice that it made this book a treat for the ears! This was another excellent book, centered around an aspect of Canadian history with which I’m not very familiar. I may have learned about it in high school history class, but if I did I don’t remember any of that (and high school was a few years ago!). So, this was a learning experience for me too. I enjoy books that inspire me to do further research, to learn all I can about the people/places/events of which I’m unfamiliar. The Deportation of the Acadians occurred in 1755-1763 and approximately 10 000 Acadians were deported. Yet another example of people being forcibly removed from their homes and sent away. It’s a sad aspect of Canadian history which leaves lasting effects . I enjoyed the story and the characters and the resolution of the story at the end, even though there was heartbreak along the way. 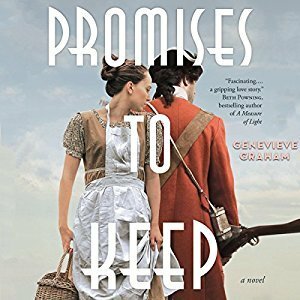 I didn’t take any notes while listening to this book (usually I do), but I enjoyed the author’s use of words as she weaves this story throughout the events of history that took place. Thank you again to author Genevieve Graham. I enjoyed this opportunity to listen to and review this book; and I will definitely recommend your books to others who enjoy reading Canadian historical fiction as well. *My progress for the Canadian Book Challenge is 6/13!! < Previous TBR Pile for Summer: Completed!! !